Last May, archaeologists excavated seven skeletons at Beckery Chapel near Glastonbury in Somerset. Radicoarbon dating suggests that the male remains are from the 5th or early 6th century and were found at a site where a further 50 to 60 skeletons were uncovered in the 1960s. It is believed that the site is that of a monastic cemetery and is the earliest evidence of monastic life in the UK. The discovery is particularly significant given that legend claims Beckery Chapel to have been visited by the mythical King Arthur himself, one of the most fabled kings in British history and an early embodiment of English national identity. Whether King Arthur was based on a real-life monarch, was the amalgam of several heroic historic characters, or simply a fabrication by medieval chroniclers seeking to espouse an ideal ‘Englishness’ of character is unclear. However nearby Glastonbury Abbey is heavily associated with Arthurian legend, with Glastonbury Hill often seen as the location of the mythical Avalon. Contemporary chronicler Gildas had written of the heroic but failed resistance of one Ambrosius Aurelianus, ‘King of Britain’, against an invading Saxon horde around 500AD. The story was further embellished in the eighth century by the Bede, that most venerable of monks, and then by the compilers of the Anglo-Saxon Chronicle in the 9th century. This appears to have been the foundation of the Arthurian legend. Not until Geoffrey of Monmouth’s writings of the mid-12th century did the saga of King Arthur take a clear form and in the 1170s French chronicler Chretien de Troyes added to the mix ideas of chivalry, knightly tournaments and the Holy Grail. 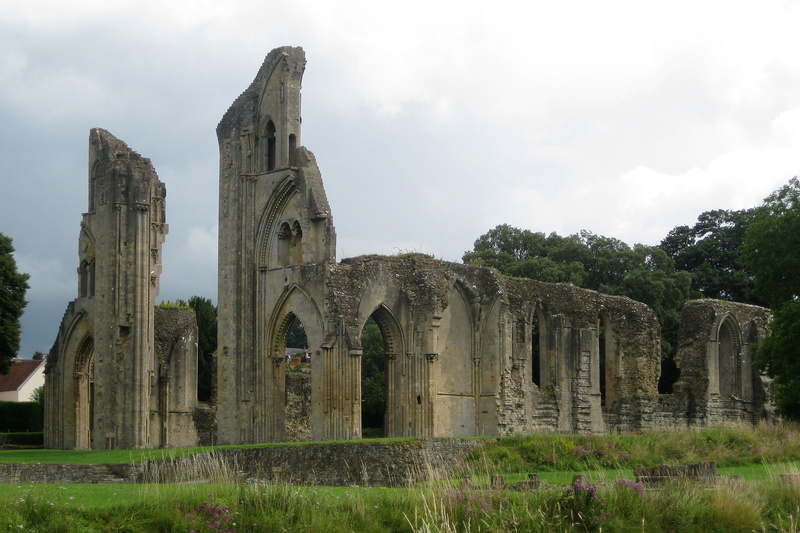 The ruling Angevin kings tried to claim descent from Arthur whose body (and that of his wife Guinevere) was ‘discovered’ at Glastonbury Abbey in 1191. From thereon many of England’s rulers would claim to be the ‘true heir’ of this benevolent king, however dubious the evidence surrounding his purported life and death. Mythology often plays a central role in the founding stories of nations and, to an extent, its failure to be corroborated by historical evidence is irrelevant such is its power over the popular imagination. This is significant, for referencing popular legends in relation to historic discoveries can help draw attention to something that would otherwise be largely overlooked, consigned to the realm of academic journals. The revelation of this early monasticism is undoubtedly important, for it marks a central place in the history of Christianity in the UK, a force of both unity and destruction for more than 1500 years. King Arthur probably never existed. Yet his legend, rather than being a distraction from history actually enhances its worth in the public realm by drawing the attention of people to subjects they might not otherwise give a second thought to. It is not always important how we introduce people to history, even if it is by means that some crusty old scholars might consider deceptive. After all, how often do the ‘facts’ of the past turn out to be as fabulous and nonsensical as the myths that are equally-important in shaping our national identities? Previous Previous post: Royal Navy ‘Woefully Low’ on Warships: a testament to Britain’s General Decline?